Firstly I would like to thank all the players who participated in Saturday’s game. It was played in particularly testing conditions but I think we had a great time. Thank you all for coming. I will strongly recommend another trip to this venue, with such shocking weather everywhere on Saturday and many courses closed, they nailed the weather forecast and bent over backwards to make sure our game went ahead. Yes it was a bit boggy in places and the greens wet, but we played that was the main thing. The course itself was lovely and a real good challenge. It would be a great place to play in the Summer! the last minute, I’ll bet they are glad they came. The runner up was another late entry, Ricky Bleasedale with 36 pts, he was only there because his camping holiday was a wash out. Well done mate. 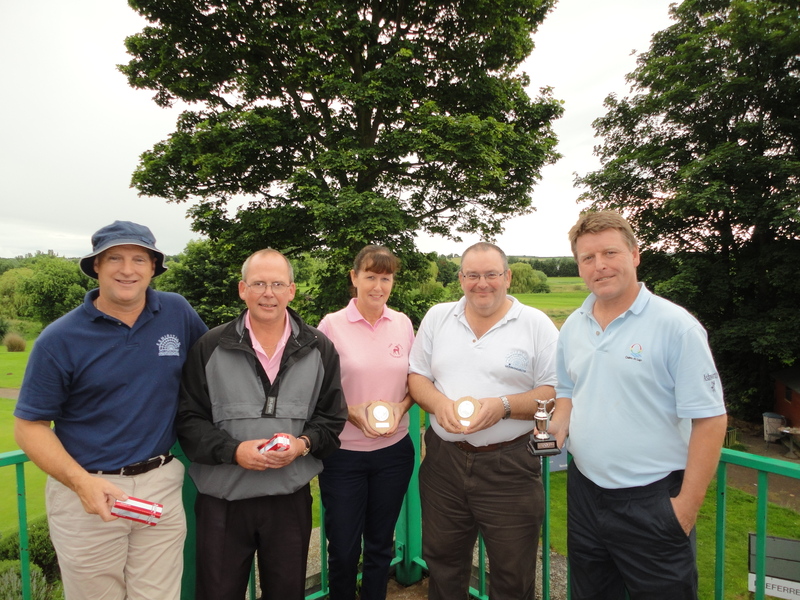 The longest drive was won by Babs Willis, very well done Babs it was a great shot. The nearest the pin was won by our chairman Mr Steve Tatham. Well done Steve. Finally we come to the Captain’s special prize, this was won by our secretary, the former Captain of Wyboston, Mr Rob Syer. On the 1st tee Rob drove off and somehow managed to Nutmeg himself and put the ball (with massive spin) just on to the fringe off the putting green which was sited immediately to his left. How the hell he managed it we will never know but he did! Priceless Rob, you did recover though and took it all with good humour. Our August game will be played at Brampton on the 18th, we tee off at 2pm, it is £8.00 for Brampton members and £28.00 for non members. If you can make it please try to come as the world and his mother seem to be on holiday that weekend but we have enough members now for a half decent turnout. Finally there is a meeting at the Exhibition at 7pm next Wednesday 25th all welcome. The Handicaps page has been updated after our trip to Suffolk.